World teacher’s day which is also known as International teacher’s day is around the corner. It is a special day to respect and honor the efforts of a teacher in making your life more successful and bright. Teachers are considered to be the investment for the growth and development of any nation. The efforts and hard work of a teacher in shaping up a student’s career can never be measured in any sense. 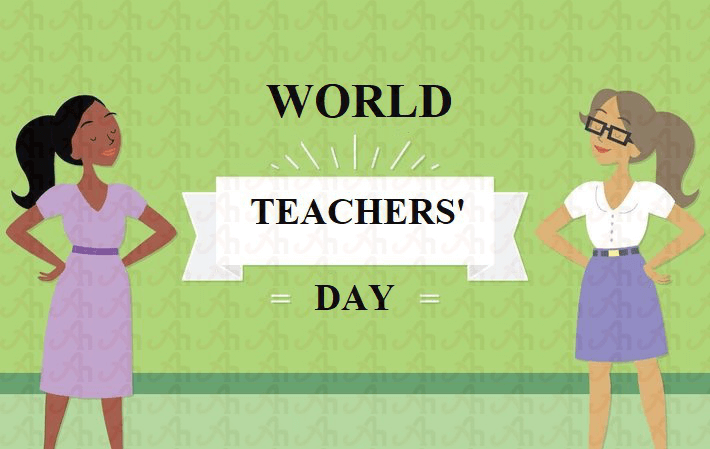 World teacher’s day is the perfect day to express the love and respect to your teachers and thank them for their extraordinary efforts in guiding you the perfect path. October 5 had been chosen as the World Teacher’s Day by UNESCO. Formerly the Teacher’s Day was celebrated differently at a limited scale or country level. But in the year 1994, UNESCO however, since 1994, UNESCO executed the commemorations of the footing of being a teacher to a bigger level by commencing the World Teacher’s Day. The celebration has constantly been executed on October 5 since the year 1994 with the same objective of honoring the teacher’s association and their efforts worldwide. The chief aim is to enhance the support for teachers and educators around the world and assuring them the fulfillment of their educational requirements in future as well. The celebrations related to world teacher’s day hold a special significance. Numerous events and arrangements tend to be organized by educational associations in various countries on October 5. These events include honoring and paying tribute to the teachers for their wonderful contribution in teaching community. Various seminars and conferences can also be observed on this particular day. Training sessions also take place to encourage the budding group of teachers and educators in order to boost up their confidence. Many recruitment drives are organized in schools, colleges and institutes to provide a platform to teachers. Several programs and skits are also performed by the students in which they give a title to their teachers and thank them for love and affection. Students tend to greet and thank their teachers by presenting them the flowers and wishes. Pupils love to gift handmade cards to their teachers as a token of affection and respect. Teachers appreciate the efforts of their students in making their day special and memorable in each and every sense. It is likely not a surprise to accept the fact that teachers are the true blessings for the growth and development of student as well as of the entire nation. The world teacher’s day is celebrated with great zeal and enthusiasm all around the world. Great teachers know how to boost up a student’s confidence level by streaming lots of positive vibes. More than 100 nations tend to celebrate this special day called World Teachers’ Day with great honor. Students must respect their teachers in each sense. The future of any depends upon the students an indirectly on the teachers as well. Teachers contribute and sacrifice a lot in bringing the best in students. In order to promote empower among the educators and teachers special events take place in numerous parts of the world on this special day. It is the high time to spare some time and thank the teachers and mentors who contributed their valuable time in shaping the career and lives of their students without asking anything in return. These small gestures can add up the happiness in their lives. A student must never forget the guidance and contributions of their respected teachers.